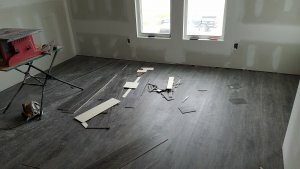 Flooring, doors and trim, paint, tile, and cabinets are in! Flooring, doors and trim, paint, tile, and cabinets are in! Here’s an update on one of our renovations in progress near UofL’s campus where we show the new vinyl plank flooring, shaker cabinets, tile, and upgraded door and trim package we chose for this awesome rental property! 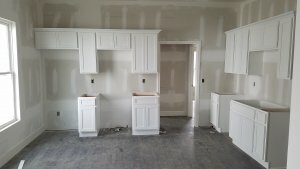 We chose really nice modern white “shaker” cabinets for this one, and with the gray slate granite counters going in, they’re going to look awesome! The flooring is also premium vinyl plank with PVC core, so it’s 100% waterproof and should last a long, long time. 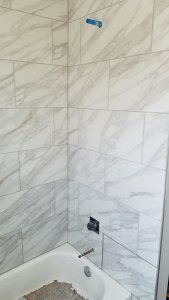 The tile is also a really nice 12″ x 24″ porcelain for the tub and shower walls, and it compliments the floor and wall colors we chose. Speaker 1: What’s up, everybody? I want to give you another update on our house renovation over here on M Street. We are getting real close to being done. We have got all the floors have been installed, the paint’s pretty much finished up yesterday. There’ll be one more day of touch-ups, but we got the cabinets installed. I think they look great. I used Cabinet Express on this one. They are all white shaker cabinets, and we’ll put some stainless steel handles on them. I’m actually going a little high-end on this rental since we’ve had some trouble with tenants messing up our countertops in the past. We’re going to put in some granite countertops on here. They’re either going to be a dark gray or a pearl black to go pretty nicely with the white cabinets, gray walls, and the really dark … It’s almost like a black. It’s a really dark gray/black floors, and they’re really dirty right now, so you can’t see them that well, but I just wanted to walk through real quick with you. Living room’s back there behind me. About to walk you into one of the bedrooms. These downstairs bedrooms have huge closets. You can see right there. It’s like a 10-foot closet, plenty of space. We got the tile works almost done. Not sure why the tile guy’s not here at the moment, but he should be finishing up. Here’s the bathroom. Downstairs, we have a four-foot shower and floor-to-ceiling tile. I think it looks really good. We’re going to have a white grout. It’s going to make it really pop. This is the downstairs bathroom. Then, upstairs, pretty much is just a bathtub with the same tile around the outside of it. We’re getting close. I hope to give you guys another update here soon with everything done and cleaned up and get this thing rented May 1st. See you then.